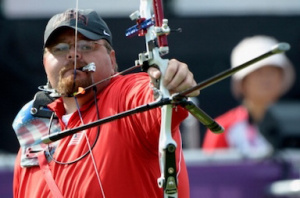 Eric Bennett is a Paralympic archery athlete and has competed in three Olympic Games. He placed 9th in the 2008 Beijing Paralympic Games (compound), 4th in the 2012 London Paralympic Games (recurve), and 8th in the 2016 Rio Paralympic Games (recurve). Bennett began shooting archery at the age of seven. He was in a tragic car accident as a fifteen-year-old that led to the amputation of his right arm. He was away from the sport for ten years until his father encouraged him to try it again. He made his first world team in 2007 and since then has been a part of the US National team competing in three World Championships and three Paralympic Games. He is the first American to compete in two different disciplines (compound and recurve) at two different games. He is also the first American to win a World Championship in the Para Recurve division. He is a four-time National Champion and currently holds several world records. Bennett teaches high school physics and engineering in Surprise, Arizona. He and his wife, Rachel, are the parents of two children. He is a member of The Church of Jesus Christ of Latter-day Saints. This page was last edited on 29 December 2016, at 14:43.